Transform patterned paper into wonderfully personal greeting card. One creative way is to make both folded card and pop-up. 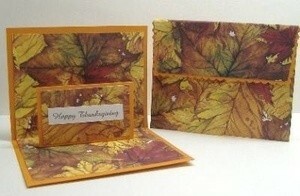 Make a card out of cardstock. Cut patterned paper to desired size and fold in half. Using craft knife and ruler, cut two slits in center, 1/2 inch apart, that overlap the crease at one end by 3/4 inch. Close the card carefully so that center strip folds at each end and pops out. From coordinating cardstock, cut a small rectangle. Layer patterned paper. Glue to back of pop-up card. Print message on white cardstock; trim and glue to front of pop-up. Then trace the top flap onto coordinating cardstock. Trim with decorative scissors. Adhere. This is beautiful. Thank You for posting it with the instructions.